Welcome to Jamuna Engineering CompanyManufacturer & Exporter ofPlywood & Prelim MachineryWe are an ISO certified company, incepted in 1986 at Yamunanagar. Our customer centric approach hashelped us to earn market across Africa, Europe & America. Large production capacity, punctual delivery system & specialized R& D wing are some of the plus pointof our organization. Our client list includes Green Plywood Industries Limited & Archie Plywood. We are engaged in offering premium grade Plywood Machinery, Veneer Lathe Machines & GlueSpreaders. Our Rip Saws, Thickness Planners & Core Dry Presses are a class apart. We are specialized in offering Chain Mortising, Finger Shaping Machines & Scissor Lifts. 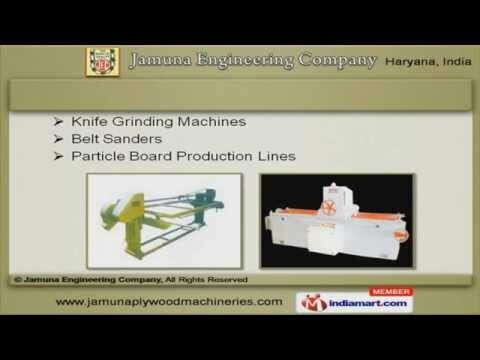 Along with that we provide wide array of Knife Grinding Machines, Belt Sanders & Particle BoardProduction Lines. Rotary Log Peeling Machines & Short Cycle Lamination Hot Presses are some of our best sellingproducts. We also offer Log Debarker & Spindleless Log Peeling Machines.